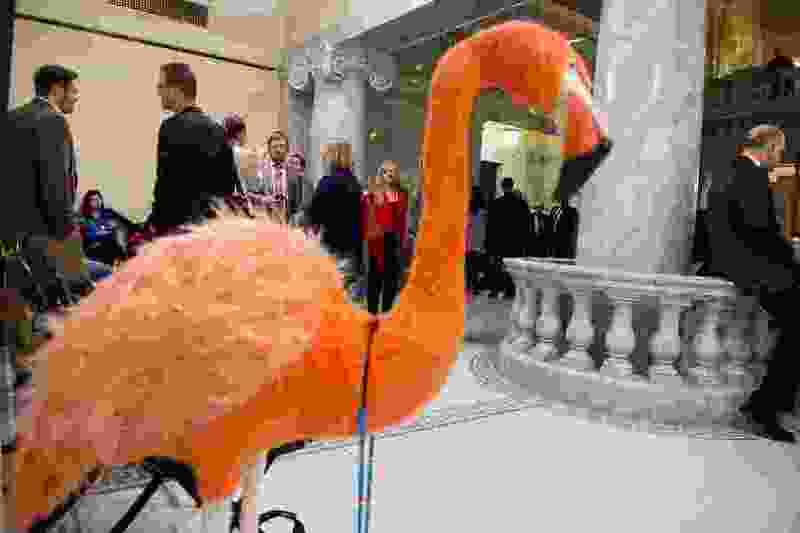 (Trent Nelson | The Salt Lake Tribune) Lobbyist Spencer Stokes's pink flamingo (the Flamingo Forum) outside of the House Chamber in Salt Lake City, Thursday March 8, 2018. There were winners, but there were also some losers. Here’s a brief list, but this is just scratching the surface. EnergySolutions • Lawmakers showed their No. 1 campaign donor some love, approving a $1.7 million break on state fees. Highway safety • The Legislature quickly kicked to the curb a proposed ban on driving while using a hand-held cellphone. Electric and hybrid vehicle owners • Under a transportation bill, registration fees will increase substantially. Public schools • If all the pieces fall into place — including a 10-cent gas tax increase before voters in November — schools could see an estimated $375 million annual funding bump. Gun-rights advocates • Despite a push by GOP House Speaker Greg Hughes, lawmakers balked at passing any new gun laws in the wake of the Florida school shooting. Salt Lake City • Mayor Jackie Biskupski denounced as an “unacceptable” power grab the Legislature’s creation of a new authority to oversee development of a trade hub in the northwest quadrant.